FINALIST – 2017 National Indie Excellence Awards. Diane is a warrior. 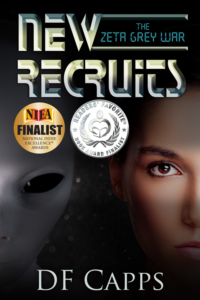 After she witnessed her twin brother being taken by a UFO, her rage at his abduction drove her to become a top-rated combat pilot with the Navy. Fate intervenes when she is recruited into a secret space program. The U.S. Space Command is desperately trying to find a way to destroy the Zeta Grey flying saucers. These predatory aliens are covertly stalking the people of our world and subjecting them to terrifying medical and genetic engineering experiments. Diane Zadanski, the female protagonist, finds herself drawn into a world of aliens and their covert colonization that amounts to a slow, long-term invasion of our world. She also discovers we are not alone through contact with two other human races, whose visionary mission is to help us transform our world beyond the control of greedy corporations and their secret conspiracy to control the government and our progress into a higher level of technology and civilization. This science fiction thriller is not your ordinary alien invasion fantasy. The aliens are not monsters, but intelligent beings with an undisclosed agenda. This conflict is going to be long and hard. It is a time for true heroism and sacrifice to rise up against the overwhelming odds.